This week we’ve heard that Disney will be looking at “spinoff and prequel” ideas for the live-action Beauty and the Beast movie that has just come out. But they don’t need to look at other options, because there is one obvious and perfect choice: A movie about Gaston. Ever since I saw the live-action Beauty and the Beast I have thought about Luke Evans’ Gaston approximately... oh, every five minutes. As I said in my review, Evans is far and away the best part of the remake. While everything else added to the film felt like a stumbling block, Gaston’s scenes were a delight to behold. It wasn’t exactly that Gaston had depth so much as he walked a line of menacing and hilarious that just worked. Yes, the movie stumbled a little bit with the added backstory its given the character—but the sheer magnetism of Evans (and Josh Gad as LeFou) manage to pull it off. We know from interviews with Evans that Gaston’s a local hero because he saved Villeneuve from raiders. And the movie calls him captain and talks about the “war,” which is where LeFou decided to follow him. And I want that movie. I want a “Gaston at war” movie a lot. Here’s the thing: I don’t want to make Gaston sympathetic. Gaston’s scary because he’s not in possession of magical powers or a family member or royalty. He’s basically a guy who, by virtue of being handsome and physically strong, has never been denied anything, ever. His evil is a sort of everyday kind of threat. And charting that path would be fascinating. 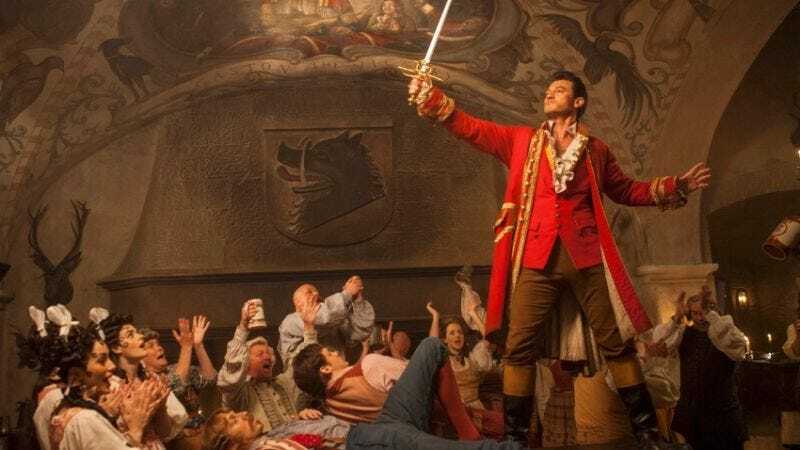 A movie that shows how Gaston saved the town and won the adulation of its inhabitants would be entertaining, but a movie that also showed how his actions and approval don’t make him a good person would be so, so interesting. It would draw a larger line under the idea that the whole town is complicit in raising monsters and excluding Belle, in creating a mindset that lets Gaston think he can threaten Belle and murder people to get what he wants. The movie has a bit where Gaston starts to lose his temper and LeFou talks him down by talking him back to his happy place: the war. He mentions the blood, and the violence, and “the widows.” Everything he learned in Villeneuve was reinforced in the army, that violence was good and that women would throw themselves at him. Belle really wants to leave the village, but Gaston shows that the world outside Villeneuve isn’t necessarily better. Gaston comes back from the war even more full of himself and even more prone to rage and violence. Again, it makes Gaston more three-dimensional but it’s important that Gaston isn’t “wounded.” He’s a guy who never challenges his advantages or ever thinks to take “no” for an answer, war hero or not. The movie also says that not only does Gaston want Belle because she’s beautiful, but because she’s not falling all over herself to win his favor. It’s a surprising bit of depth for a character who is otherwise so shallow. It’s not just wanting what he can’t have, but wanting something real. A prequel could show us how he comes to that decision, how all the “widows” started to lose his interest. Of course, Gaston’s motives still don’t excuse his actions. A Gaston prequel also becomes a LeFou movie. In the live-action Beauty and the Beast, it’s LeFou who arguably has the biggest emotional turn. He starts out as a dedicated patsy for Gaston, backs Gaston when he denies trying to kill Maurice (which he totally did do and which LeFou was there for), starts expressing doubt about Gaston’s actions, and finally changes sides in the final battle. A movie where LeFou idolizes Gaston during the war, where he feels like Gaston kept him alive, explains LeFou’s devotion. It also cuts out the nasty implication that LeFou, who is gay in the movie, just follows Gaston because he has a crush on him. Ever since the whole “gay moment” revelation, I have said that I wanted Beauty and the Beast to end with Gaston and LeFou realizing that toxic masculinity was the real villain the whole time. And since I didn’t get that, I would like a prequel exploring some of the same issues instead. All of those would be great things to explore in a Gaston movie. Layering it all with how funny these two actors are would only make it better; it’s easy to laugh at both of them, but there’s a real danger in them, defying you to not take them seriously. In Beauty and the Beast, Evans and Gad proved that they had enough chemistry, comic timing, and serious dramatic chops to pull their own movie off. Plus, we didn’t get nearly enough of either of them singing. Give me this movie. Please.